SUP (stand up paddle surfing) is a sport that has gained popularity around the world in the last 10 years. Surfers stand on a large board and use a light paddle to propel themselves through the water. On SUP-boards you can travel along the coast, raft on rivers and catch waves. This is a very accessible sport - just five minutes is enough to learn how to slide through smooth water with an oar. All a beginner needs is a wide and stable board. You'll feel the balance very quickly, already within a couple of hours you will be able to try a narrower sports sup board that is suitable for high speed riding and traveling. It takes longer to learn to catch harder waves. However SUP-surfing is much easier than classic surfing; it is possible to ride on 30cm waves. The only drawback of the SUP-board is its size. The 3m board means you may need a house by the sea, or a garage and transport. A few years ago inflatable SUP-boards were invented as well. They need to be pumped up with a high-pressure pump to make them very hard, and when deflated they are packed in a special backpack. These inflatable SUPs are the most popular with the residents of Vladivostok, where there are excellent conditions for SUP-surfing. Yakov Ulkin, director of SUP-gear store "Third Wave" says: "When we started SUP-surfing in 2010 we couldn't imagine that simply sliding on smooth water would be so interesting. It is something special - like meditation. You only need to try it once to fall in love with this activity forever. Now we are putting a lot of effort into the development of this sport in Vladivostok, arranging test-drives during city festivals, organizing competitions, speed races. " SUP surfing is a very popular sport in Vladivostok. On a nice day hundreds of people ride along the coast. Favorite SUP-routes for locals and tourists alike are lighthouse on Basargin Peninsula, Cape Tobizina, Labor Bay with sunken ships and Shkot Island with its caves and lagoons. 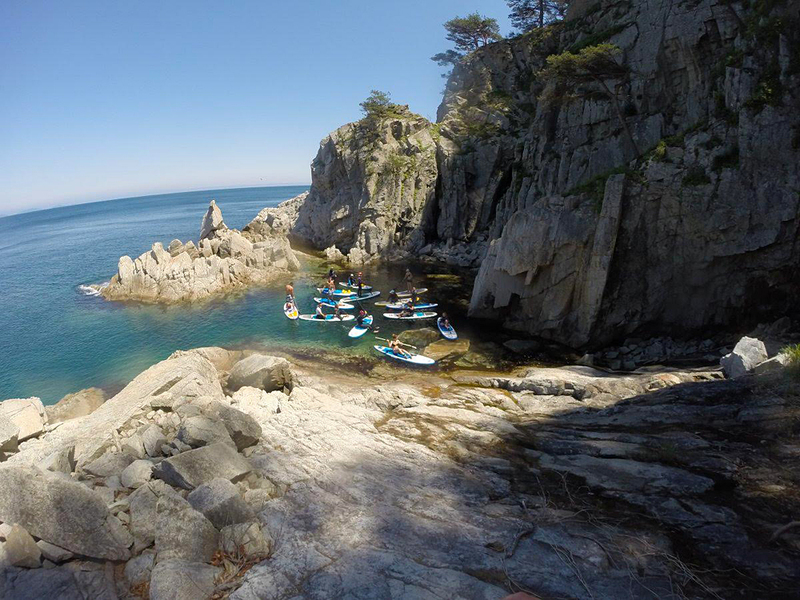 Sable Bay is considered to be the best place for SUP-surfing in Vladivostok: Thanks to the special seabed topography waves here are long and the most suitable for surfing. Russian fans of SUP-surfing ride even in the winter in the Far East. For an experienced surfer the risk of falling off the board into the water is minimal. At a temperature just above zero one can comfortably ride in an ordinary diving suit. In winter, Amur and Ussuri bays around Vladivostok look fascinating: The water is very clear, and floating ice forms a beautiful geometric pattern. If you are lucky, you'll meet seals. In winter they are not afraid to swim and bask on the ice right in the city.